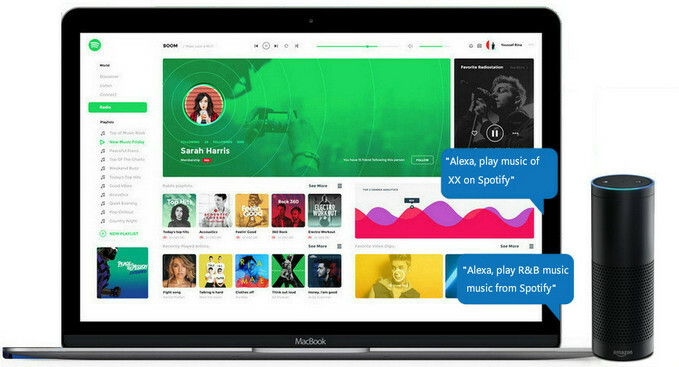 Spotify is always at the top of music streaming music services list over the years because of its large music library, attracting feature on music discovery and beautiful user interface (especially on mobile devices). It also fully supported by most of smart sound devices like Amazon Echo, Sonos, Google Home, SoundTouch, Ruku player, and etc to enhance user’s music experience, for example, users are allowed to play music on Spotify with voice control on Alexa devices. Yes, it is very convenient to ask Alexa to play certain songs, playlists, artists, or albums on Spotify. The following part will show you the specific steps on how to play your Spotify music on Alexa devices with voice control. How to Play Spotify Music on Alexa? We shall go to show you guys 2 simply ways to play Spotify music on Alexa. Step 1: Connect sound device like Amazon Echo to Amazon Alexa app. Please download Alexa app from Apple Store or Google Play then register it and connect it to speaker. Run Alexa app on your phone or tablet if you have installed, then tap Setting button from the left panel, then tap Music & Media on the right. A screen will pop up to list all music streaming services supported by Alexa, and you can click "Link Account on Spotify.com" from this screen. 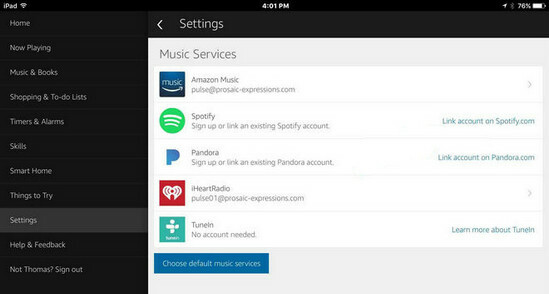 A new screen "Connect Alexa to your Spotify Account" will show next as displayed below. Click the green button "Log in to Spotify" and enter your user name and password of Spotify account. If you have no Spotify account, you can use your Gmail or Facebook to sign up here directly. Finally, a window will show up displaying "Your Spotify account has been linked successfully". Now, you have successfully linked Spotify account to Alexa. 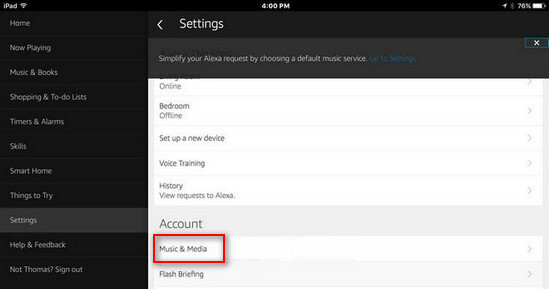 Back to the Music & Media section of the Alexa, and you will see that your Spotify account is linked. Then select Spotify as the default music service. Now, you can ask Alexa to play specific artists, songs, genres of music, albums or playlists on Spotify. Because you set Spotify as the default music source, it will play music automatically only from Spotify, You can also ask Alexa to raise or lower the volume, skip to the next, repeat songs and get information about the song being played with Alexa music commands. Go to Spotify app to choose the Alexa devices like Amazon Echo to play music. On the bottom screen of the Now Playing, you can press "Devices Available", and a black screen will be shown to let you choose one from list of all your connected Alexa devices. Just select one you want to play. 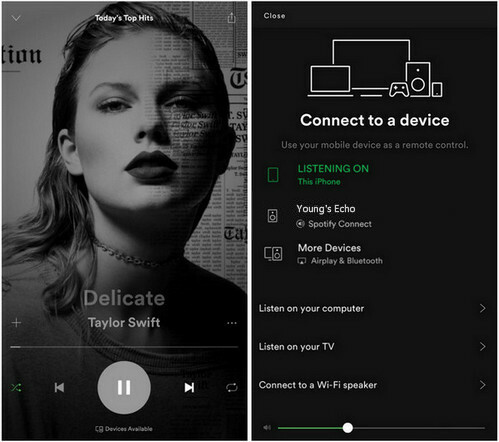 Spotify allows users to listen to music for free without Preminum, and this is a highly appreciated feature compared to other music streaming services, though the free account has many limitations like ads-playback, 192 Kbps in Ogg audio quality, and no offline listening. So if you want to download Spotify music with higher audio quality (320 Kbps in Ogg) for offline listening on your multiple devices, Spotify Premium account ($ 9.99 per month) is needed. But is there any way to download Spotify music or playlist to local files with free account? Yes, of course. If you have Spotify Free account, you can turn to Sidify Music Converter for Spotify to help you download Spotify music or playlist to common audio files like MP3, AAC, FLAC or WAV, then you can transfer these downloaded Spotify music to other portable devices like moble phones, tablets, or MP3 player for offline listening while flying, or import them to other video editor to make it as the background music. Click icon or Click Here to Add Audio, then drag and drop any music file or playlist from Spotify music app to Sidify adding window. After you finish adding the tracks or playlists, click "OK" to check. Then tap button on the top right corner to customize the output parameters including output format, output quality and conversion mode. You can choose format as MP3, AAC, FLAC or WAV, and if you want to download music as higher quality, you can choose FLAC as the output format, and adjust the output quality up to 320 kbps. In order to help you organize the music library after finishing downloading, Sidify program supports saving the output audio into Artist, Album, Artist/Album or Album/Artist folder for meeting various users needs. Now, you can click "Convert" button start downloading Spotify music or playlists. After a cup of tea time, you can come back to check the downloaded Spotify music by clicking button. The Spotify music or playlists you downloaded with Sidify Music Converter for Spotify would be saved to your local drive, and you can listen to them offline on multiple devices, or use it for personalized editing on other programs.